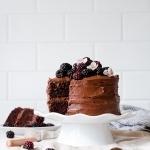 Juicy blackberries and rich, dark chocolate combine in this moist and decadent blackberry chocolate cake, finished with an equally luscious blackberry chocolate buttercream frosting and fresh berries. I’m a big fan of sneaking fruits and vegetables into chocolate baked goods – bananas, pumpkin, zucchini, berries, you name it – and this blackberry chocolate cake is no exception. The plump, late-Summer fruit, cooked down into a fragrant, jammy blackberry mash, adds a subtle, but welcome fruity complexity, moisture, and faint reddish hue to an already deeply cocoa-filled cake. It’s a rustic cake simple enough for everyday baking, with flavors unusual enough to feel decadent for special occasions. The batter comes together easily – one pot for a homemade blackberry jam (which flavors both the cake and frosting), one bowl for the rich, chocolate batter, one for the chocolate buttercream frosting – and makes use of the tangles of wild blackberries growing with abandon in our backyard this time of year. On a personal note, this cake is also a celebration of the upcoming arrival of our little one, who is about to change our lives forever, turning our family of two into three. And almost as important, my husband making it back in time for his birth. In a clear example of ‘we make plans, and the Army laughs,” or, the worst timing in the world, he unexpectedly deployed again, for the second time this year, in early July… right around the time I hit the seven and a half months pregnant mark. There were and are a lot of emotions around that, and a good deal of logistics and details to figure out, and we decided it would be best for me to pack up and head down to California, to stay with my parents, just in case I went into labor early. So I’ve been back in my childhood home for the last few weeks, trying not to succumb to the stress and the overwhelm and the hormones, and majorly willing this baby to stay cozy until at least his due date. Thankfully, as of yesterday, he has cooperated. We are full term, the hubs is here, and he’ll get to meet his son right away, instead of early next year. My husband is still going to miss so much when he heads back out to the field after a precious ten days together after the birth, and I haven’t even begun to process what those first few months solo-parenting will be like. But for now there is cake. 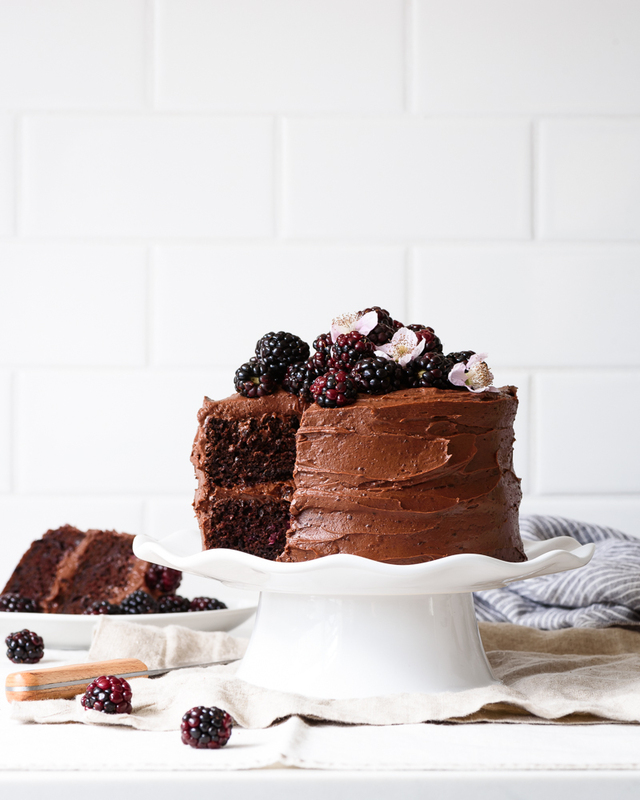 Wonderfully decadent blackberry chocolate cake. And he’s home. And so, there is lots to be thankful for. This will likely be my last recipe until our little guy arrives, and I’m not sure when I’ll get back into the kitchen. I’m already looking forward to fall and holiday baking, and hopefully, once there’s a bit of an established rhythm to this whole new mama thing, I’ll be popping in again before too long to share some goodies with you. Thank you as always for following along and supporting this space – I truly couldn’t do this without you!! Add the blackberries and 1/4 cup sugar to a medium sauce pot, and bring to a boil. Turn the heat down to medium, and simmer for 10 minutes, smashing with the back of a spatula now and then, until the berries burst and become jammy. Preheat the oven to 350 degrees F. Line two 8-inch round cake pans with parchment paper rounds and lightly grease with butter or baking spray. Set aside. 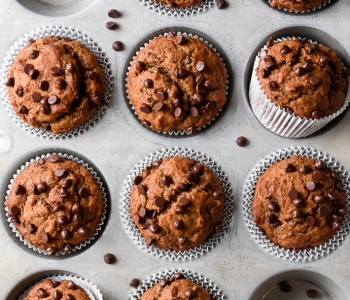 In a large mixing bowl, combine the remaining 1/2 cup sugar, flour, cocoa powder, espresso powder, baking soda, and salt. Stir in the oil, milk, egg, and vanilla, and mix until completely combined, but not overmixed. 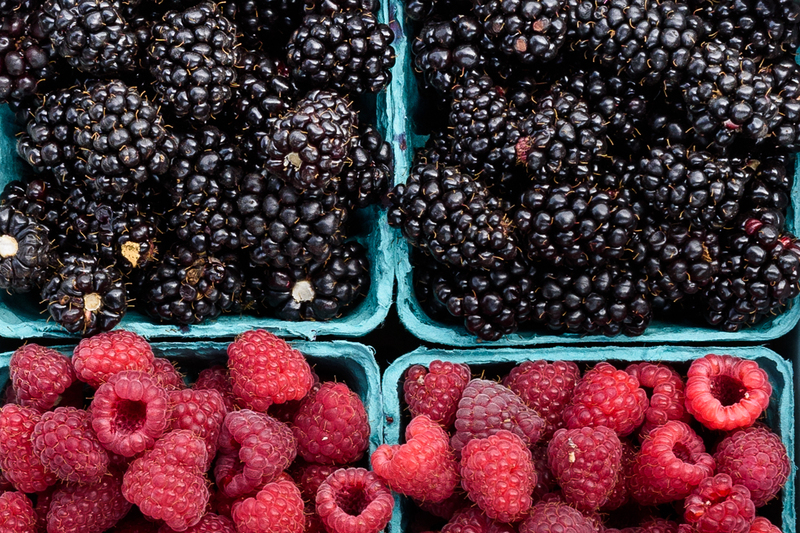 Use a spatula to fold in the blackberry mash, until combined. Divide the batter between the prepared baking pans, and smooth into an even layer with an offset spatula. Bake for 35-45 minutes, until a cake-tester inserted into the center of each cake comes out clean. Remove from the oven and let cool in the pan for 20-30 minutes. Carefully flip the pans over to remove the cake, and let cool completely before frosting. Using a stand up mixer fitted with the paddle attachment, or a hand mixer, beat the butter on medium-high speed until light and fluffy, about 2 minutes. Add the sifted cocoa and powdered sugar, a half cup or so at a time, until the frosting is thick and creamy. Drizzle in the reserved blackberry syrup until the buttercream frosting reaches your desired consistency. It should be spreadable, but thick enough to hold its shape on the cake. 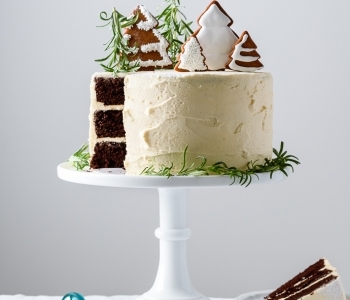 Place one of the cake rounds on a cake stand or plate. Spread a generous layer of buttercream over the top, using an offset spatula to create an even layer, about 1/2-inch thick. Top with the second cake, top side down. Generously frost the top and sides with the remaining buttercream,² and top with fresh blackberries. 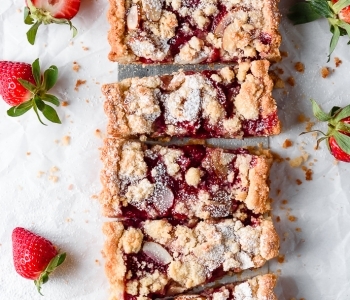 Refrigerate for at least 15 minutes for easy slicing before serving. Enjoy! ¹ The espresso powder can be omitted, but I like to add just a pinch to chocolate recipes. 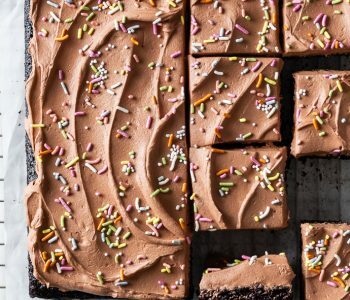 It won’t add much of a coffee flavor, but enhances the natural chocolate flavors of the cake. ² I kept the frosting rustic on this cake (and didn’t spend the time to do a crumb coat). For a smoother, less “homemade” look, spread a thin layer of buttercream on the sides to lock in the cake/crumbs, refrigerate for at least an hour, then spread on a final, smooth layer of buttercream. 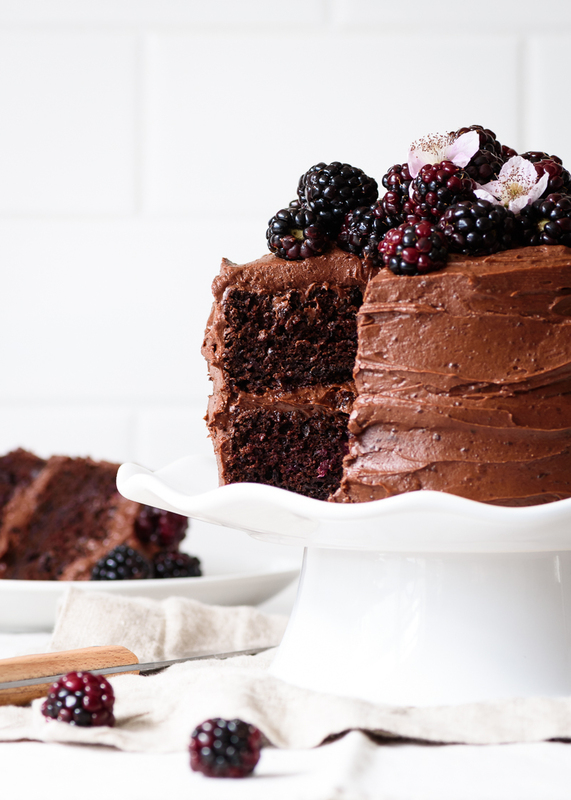 ³ If you’d like to make this blackberry chocolate cake into cupcakes, look no further. ⁴ The original recipe happens to be vegan, but, worried about the stability in layer cake form, I did add an egg. You could likely replace that with a flax egg, or take your chances without, but I haven’t tested it. Thank you for sharing! I thought the cake and frosting were delicious. I would have enjoyed more blackberry flavor. 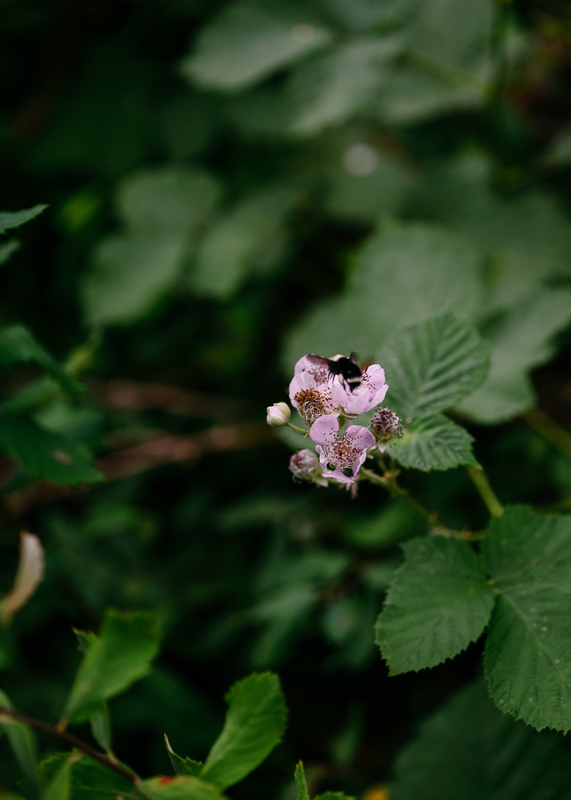 I was primarily aware of the blackberries due to the crunch and texture of the seeds. I substituted gluten free flour due to an allergy. I think I must have missed the part about finding a way to remove the seeds. I did the seive assuming that was just to strain the liquid out. When I made the cake it was so seedy with the blackberry seeds I couldn’t stand it. I found if you just omit stirring the blackberry mash in, just making the chocolate cake with the frosting as directed it is much more devine! Oh, Laura, that’s such wonderful news that your husband arrived in time for your son’s birth. And the cake, of course, looks positively delicious. I’ll look forward to your return to the blogosphere once the rhythm of your new life takes hold.